After reading Problems with Kerberos authentication when a user belongs to many groups and from Shane Cothran’s post “keep in mind there is a hard limit of 1,015 groups a user can be a member of” - creating a user with a lot of groups seems like a good start to get to the 12000 bytes size. This can be scripted to create 1000 groups. And repeat for all 1000 groups. Connect to a CIFS share - with a user that’s not got over 900 groups - from a test machine. Then try connecting with the testuser created above. Does it work or not? It does indeed work and it’s using Kerberos. The token size was not greater than 12000 bytes. There are 1001 groups in the token. - 1 are domain local security groups. - 1000 are domain global scope security groups inside the users domain. - 0 are domain global scope security groups outside the users domain. - 0 are universal security groups inside the users domain. - 0 are universal security groups outside the users domain. The primary group is Domain Users. There are 0 SIDs in the users SIDHistory. The current userAccountControl value is 66048. Token size is 9240 and the user is not trusted for delegation. 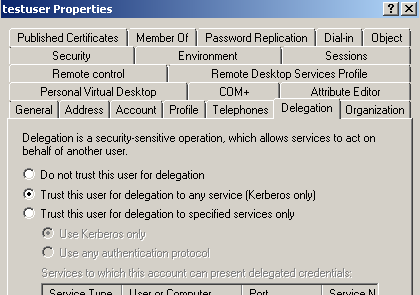 So, thet’s trust it for delegation to increase the size of the Kerberos ticket. The current userAccountControl value is 590336. Token size is 18480 and the user is trusted for delegation. Processed 8 of 8 user accounts = 100.00 % complete.